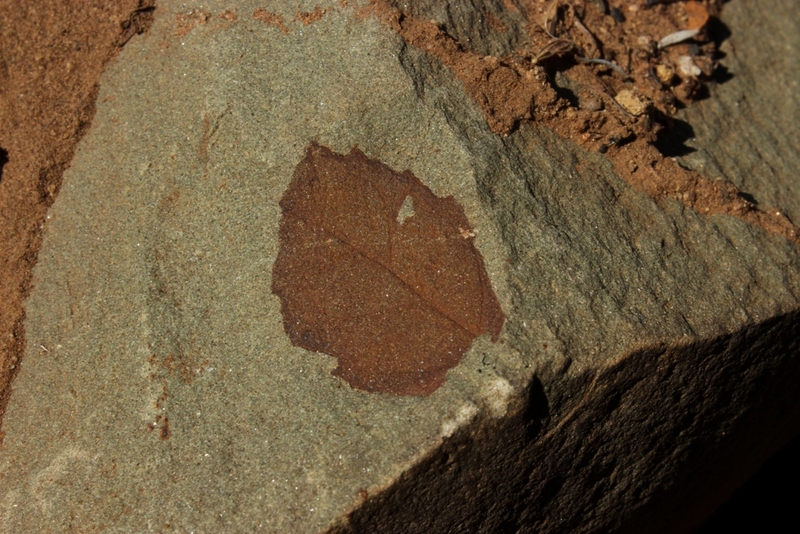 Fossilized oak leaf found along the Sespe Trail. Note the veins and serrated edges. I didn’t start walking from Piedra Blanca Trailhead until a few ticks before ten in the morning, at least four hours later than I had hoped to begin my hike. Everybody else had long since hit the trail. I was the lone straggler. 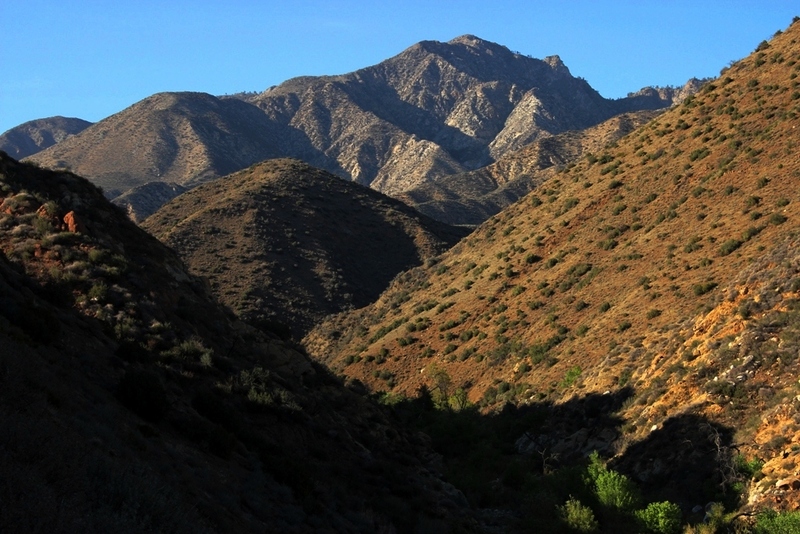 With about 16 miles to hike, struggling with the weight of an overloaded pack beneath the unpleasant Sespe sun, which at times makes a person feel like an ant being scorched under a magnifying glass by some malicious giant in the sky, I was concerned about making Sespe Hot Springs before sundown. I had no doubt that I’d make it in a day, but thought I may have to finish by headlamp. 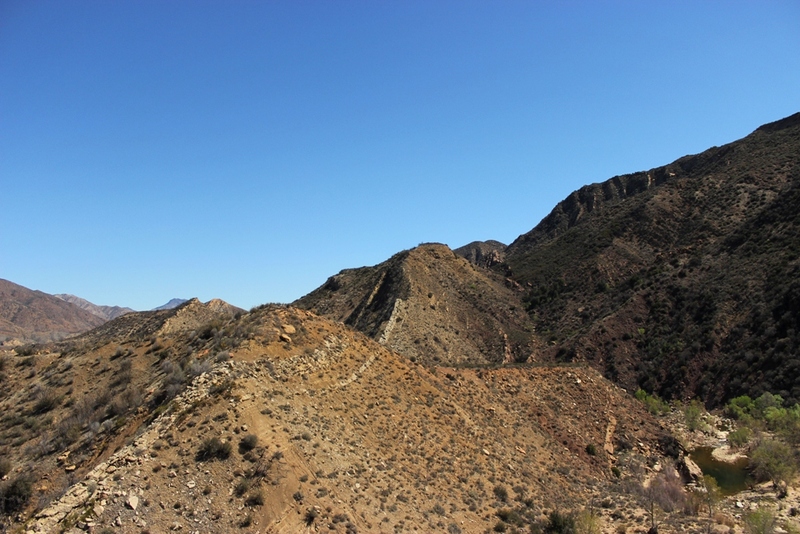 But never having hiked up to the hot springs from Sespe River, I was not relishing the thought of finding my way for the first time up an unknown canyon in the dark even if the trail was well traveled. Sespe River or is it a creek? There seems to be some confusion, but if the Santa Ynez can rightly be labeled a river than so too should the Sespe for it is, when flowing, long, powerful, deep and dangerous. 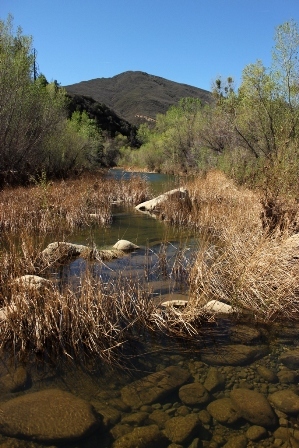 Long segments of the Sespe River Trail wind alongside the watercourse nearly entirely devoid of shade. Longer stretches, that is, than one might prefer with no shadows sufficiently large enough to provide respite from the blistering solar radiance. Winter here can feel like summer. 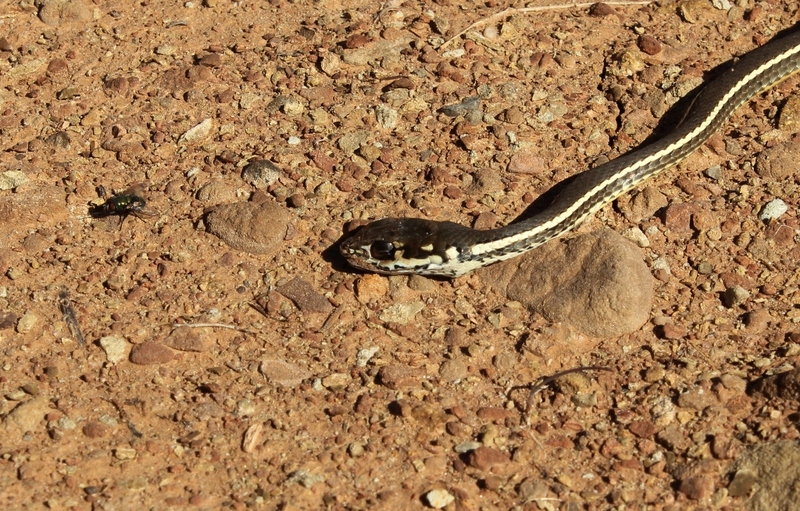 While it may be chilly in what shade may be found, hiking the exposed trail on a cloudless day can be unpleasantly hot. In summertime it can be downright brutal. I continually passed deep, cold emerald pools because I hadn’t sufficient time to stop for a swim. It was tough to disregard the growing urge to leap in the water. But if I was to meet up with the others, among whom were Craig R. Carey.net, EM Walker.net, VC Canyoneering.com, I had to keep marching. Pools of the Sespe sit like oases amid a parched land of searing heat. At one turn in the river I stood on the trail peering down at the shimmering water as sweat trickled down my steamy hot face, my feet seemingly aflame from the earth’s radiant heat and the friction from constant walking. The lure of the chilly liquid, and urge for cold refreshment, was finally too irresistible to deny any longer. I plodded down a path across a grassy flat, and through the dappled light cast by old cottonwood trees along the river bank, searching for an entry point into a pool, somewhere I could leap in and instantly be enveloped in the running river of rain. I found only shallow riffling flats, nothing colored in that inviting hue of clear green characteristic of calm, deep pools. I turned and looked back at the trail climbing away from the river up the west facing, rocky, fully exposed slope baking in the late afternoon sun, cursing myself for foolishly wasting precious time and energy. I walked by prime, deep pools all day, then was lured down to the waterline along a section of the river I knew was not good for swimming. Frustrated, huffing through the sand and brush, I made my way back to the hard packed trail, hotter and thirstier than I was thirty minutes earlier, accomplishing the exact opposite of my intention. For some reason I kept expecting to walk up on a rattlesnake, something to add further insult to my foul mood, but thankfully a serpent never showed. Clean up crew. One guy’s fatality is another dude’s feast. Looking up Hot Springs Canyon at San Rafael Peak. That west flank looks mighty appetizing, though naturally it hides a number of obstacles, perhaps impassable, from brush to loose rocky slopes and unseen steep creases in the mountainside. But one never knows how something tastes just sitting around looking at the menu, you must order and have a sample. 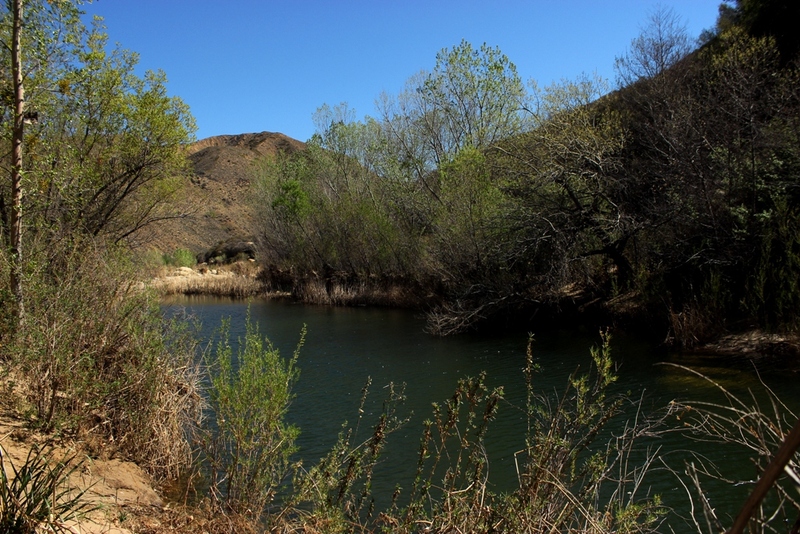 This entry was posted in Ventura County and tagged Backpacking, Camping, Fossils, Hiking, Hot Springs, Nature, Photos, Sespe Hotsprings, Sespe Wilderness, Snakes, Swimming Holes. Bookmark the permalink.